Blog › Do you require a Built In Letterbox? Whether it's a single or multiple built in letterbox unit you require, we have a vast collection to choose from! 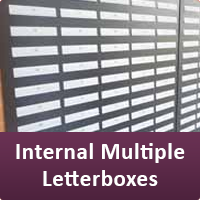 Our range caters to both internal and external letterboxes, with internal units commonly located in apartment/accomodation lobby areas. Our built in letterbox range is also referred to as our "recessed" collection, a popular choice due to its compact multiple letterbox models appearing seamless on a wall. Built in letterboxes are a convenient way to save space where restricted, perhaps what your apartment building is looking for? We supply both individual and multiple postboxes, with many stylish built in letterbox models available, the majority adopting modern designs. Our strong letterboxes are made from electro-galvanised steel, each conforming to Royal Mail requirements, the British Standard BS-EN 13724 and Secured By Design guidelines, each able to hold A4 size letters. Their extra robustness manufacturing make them highly secure letterboxes, each including gasket seals, reducing noise and any water penetration too, ideal for external use. Security locks and numbered keys are provided as standard, with a service available if you wish to get your key suited to your other devices, such as your entrance door key or garage door key, with individual and letterbox bank engraving available too. Our "through the wall" letterboxes are designed to be built into masonry cavity walls, also offering single unit or multiple units, perfect for building collective delivery points. Individual through the wall letterboxes offer rear retrieval, whilst your postman only has access to the front of your letterbox for posting. If you would like to find out more information about our built in letterbox range, or ordering a unit....simply contact our team today to enquire further.